I just met with Yuval Koren, CEO of Eye-Fi, a start-up that has created a SD card that can automatically upload images from your camera directly to the internet using a normal Wi-Fi network. Everything is self-contained on the card (SD right now, but they are working on Compact Flash version as well), including the wireless antenna. The idea is that the photos will be uploaded to a central server that then hooks into your favorite photo service, like Flickr, etc. Yuval showed me a realtime demo while we were meeting at Farley’s and it was quite impressive. Here are a few photos. Robert Scoble met with Yuval earlier week. Here’s his initial write-up as well as a follow-up, where he goes into greater detail. 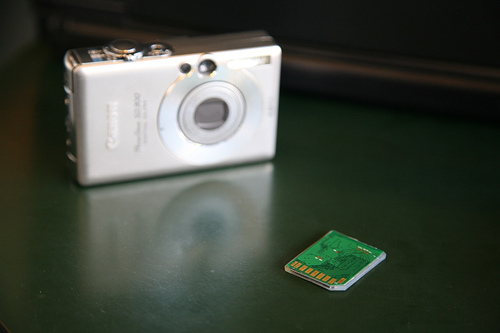 UPDATE: Eye-Fi has released their new wireless SD memory card.